Just in case no-one has noticed, Pioneer would like to highlight that the corner of Woodbine and Danforth is slowly becoming the baked goods epicentre of Danforth East. When did this transition begin? 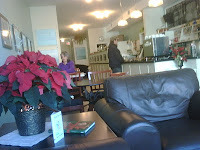 Well, True Brew Cafe and its delectable soups, muffins and comfort food was the first to break culinary ground (I know...relish was there first, but we're talking baking not tapas). Then the addition of Celena's Bakery last year brought fresh bread back to the neighbourhood at long last, and Cozy Cafe's baklava cannot be ignore. The new kid on the block is a place called Caketown, which opened a few months ago in the space next to Better Bulk (just west of Woodbine). Pioneer finally had the chance to check it out last week, and we must say, it was love at first sight. The merry holiday window display and cozy atmosphere drew us right in, out of the cold, for a hot coffee and a buttery shortbread cookie. Relaxing with a newspaper on their comfy couches was almost too tempting - we could have stayed there all day! A bonus for all you gourmands: a selection of homemade jams and jellies are on sale, including a red pepper jelly that we know will go great with some goat cheese and crackers. And.....If you are in the mood for cupcakes, the Caketown cupcakes are the cream of the crop and much better than that other cupcake shop that shall remain nameless. A recent delivery of some of these gems to Pioneer headquarters confirmed that it really is difficult to limit yourself to only one of Caketown's holiday themed confections! Tis the season for giving to great causes, and what could be a better cause than helping out a local school! 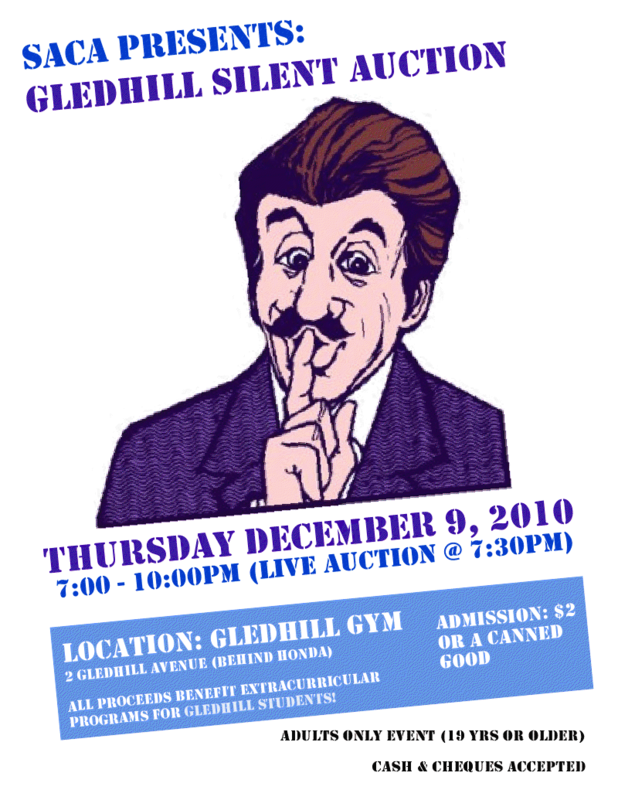 Gledhill PS is hosting a silent auction tomorrow night (Thursday Dec 9th) from 7 p.m. to 10 p.m. Proceeds go to extracurricular programs for the kids. There is an amazing list of things to bid on such as Raptors and Leafs tickets, Fine Silver Girl jewelry, the chance to shadow a Toronto Star journalist for a day (Oh!! me, me!!) plus about 200 more fun and fabulous items. It's a $2 entry fee or a canned good for the food bank. Side note: Because this is a licensed event, it's limited to those over 19.